A Forks Over Knives Picnic! National Picnic Month is here! It’s July and the whether is beautiful, which makes it the perfect time to get outside and picnic with friends and family! While enjoying the fresh air, sunshine and good company, don’t forget a major component of healthy living. Round out your picnic experience with a delicious, healthy meal with lots of veggies and fruits! Try packing a few containers of your favorite raw, summer veggies like carrots, broccoli, cucumber, zucchini and tomatoes. Fill up on those goodies with healthy dips like herbed hummus, spinach ranch dip or not-so-fat-guacamole. 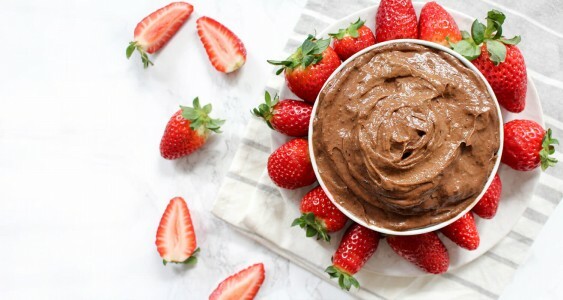 After, if you’re looking for something sweet, look no further than fresh fruits like strawberries and peaches dipped in raw chocolate caramel dip. There’s no other time of the year when these foods are more sweet and delicious. Avocado white bean salad wraps – “My go-to recipe when I haven’t the energy to do anything but collapse on the couch and watch Downton Abbey is to combine mashed avocado with mashed white beans and a few other ingredients and roll it up in lavash or stuff it into tacos or a sandwich. I’ve also been known to eat it with a spoon. The whole thing comes together really quickly and, including the time it takes to put on your sweats and slippers, dinner is on the coffee table in less than half an hour.” -Recipe adapted from But I Could Never Go Vegan! We can’t wait to get outside and share these healthy recipes with friends and family! Let us know how your picnic turned out on our Picnic Month Facebook discussion.